Hawaiian Bacon Pineapple Chicken Kebabs smothered in a delicious Hawaiian bbq sauce! Crispy bacon and saucy, charred chicken with juicy pineapple chunks, peppers (capsicums), red onion and the best garlicky-bbq sauce! Hawaiian Bacon Pineapple Chicken Kebabs are so addictive! The perfect meat on a skewer with the combination of a salty, sweet flavour packed punch. Whatever you call them, there’s no arguing that they are simple and quick to make! Throwing them on the grill ensures the chicken gets beautifully charred on the outside while staying juicy on the inside. Normally, Hawaiian chicken calls for tomato sauce. These chicken kebabs replace tomato sauce with your favourite barbecue sauce for more amazing flavour. 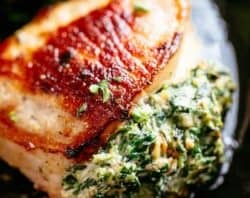 You can use either for this recipe. If using bamboo skewers, remember to soak them in water for a good 30 minutes to prevent the wood from burning on the grill. You can also soak them overnight for better results as well-soaked skewers will last longer on the grill without burning. 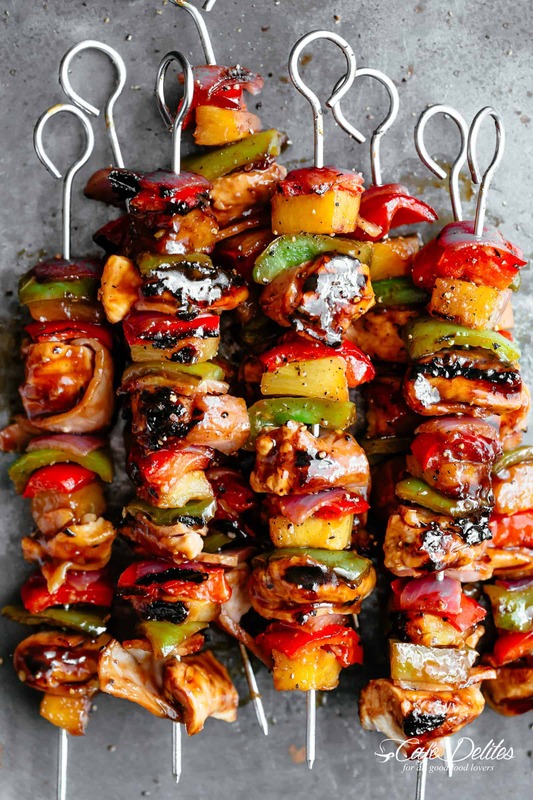 Metal skewers, however, do not require any preparation. We normally grease them with a light coating of oil. 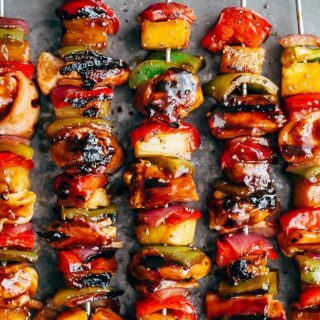 These skewers are so easy to prepare! Use a cut of bacon with the most meat. We use short cut bacon, but you can use any you have on hand. Slice bacon approximately 2 1/2 inches in length and 1-inch wide, or just enough to cover each piece of chicken on the skewer. If this type of bacon is unavailable to you, you can use the bacon you normally use for your cooking and grilling. We prefer fresh pineapple for this recipe, but you can use canned if that’s all you have. 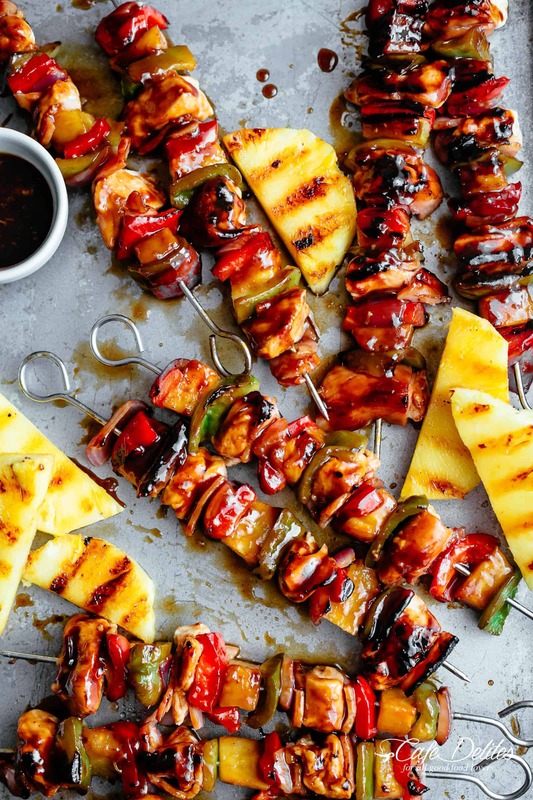 Slice any leftover pineapple into discs and serve them with these kebabs on the side! Looking for more grilling recipes? Try these! 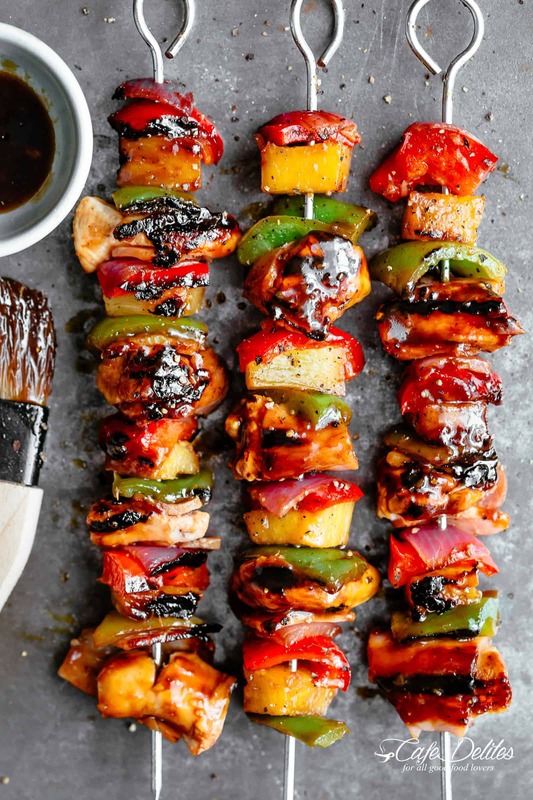 Hawaiian Chicken Bacon Pineapple Kebabs with a BBQ twist! Crispy bacon and chicken smothered in a Hawaiian style pineapple and barbecue sauce, these skewers are so addictive! 16 bacon rashers trimmed of excess fat and halved lengthways (2 1/2 inch x 1-inch). 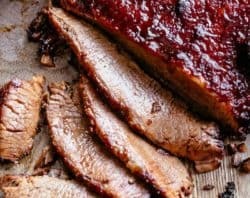 Mix the bbq sauce together with the soy sauce, pineapple juice, rice vinegar, garlic and sesame oil in a large jug or bowl. Preheat a grill pan (or grill plates on the bbq) over medium-high heat. 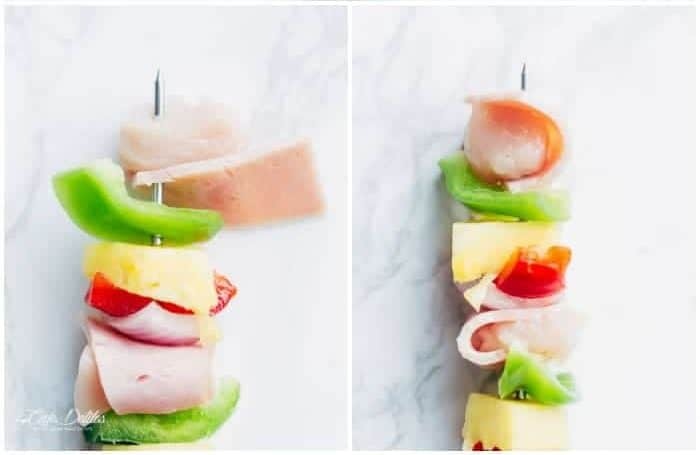 Thread the red onion, red pepper (capsicum) piece), pineapple, green pepper, bacon and chicken onto skewers, wrapping the bacon around the chicken as pictured above. Repeat until all of the chicken has been used. Coat skewers evenly with HALF of the marinade (reserve other HALF for basting). Brush grill pan or grates over with olive oil. Grill the skewers for 5 minutes; brush over 1/4 cup of reserved marinade. Turn skewers over and coat with remaining 1/4 cup of marinade. Grill for a further 4 minutes, or until the chicken is cooked through and to your liking. Serve immediately. Didn’t have skewers in the house so made it as a stir-fry on rice and it was great! Finally made the Hawaiian kabobs. Well worth the wait. More charred than I had hoped for, but I can blame that on adult beverages.? They were very tasty. We tweaked the marinade more to our liking. Thanks for the recipe. Will definitely be grilling this again. Wish I could share a picture. I wanted to make this. It rained that night so I made a stir fry instead. Just made all ingredients in electric frying pan and added sauce mixture. It was delicious. The Pineapple really adds. Made these last night and it’s better then it looks. Cut up the chicken and marinaded it over night.Thanks for the great recipe. That is great to hear! Thank you so much for sharing and following along with me! 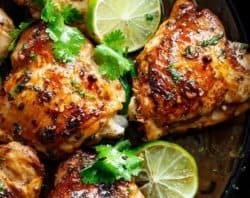 Great marinade/basting but just a heads up. You never say where to add the brown sugar. Now it’s. It not hard to figure out but you never know as not all are great around a recipe. Cheers! Thank you so much. Would you kindly tell me the oven temp you used and for how long? I appreciate your help. These look amazing. Unfortunately, we have terrible rain coming tomorrow when I want to make them. Have you cooked them in the oven? I know I would prefer them on the grill, but that may not be an option. Any help would be appreciated. Hi Kristin! Yes! I’ve cooked these in the oven until cooked through and then under the broiler to char them at the end. Still delicious! I made this for supper this week, and it was delicious! I cut up the chicken and vegetables the night before, which was a big time-saver for a weeknight. I used white vinegar for the sauce, since I did not have rice vinegar. The fresh pineapple was amazing too! 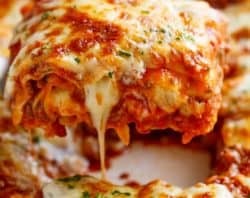 I hope to ‘wow’ our friends with this meal next time they come for supper! 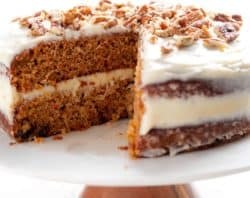 Thank you for sharing your tasty recipe! You’re very welcome Michelle! I’m so glad you liked it! 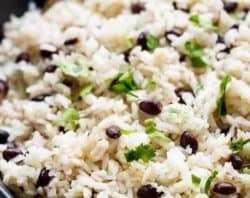 I made this recipe yesterday for dinner, it was so delicious and easy to make. I misread the amount of brown sugar, added more than required but it didn’t matter, it was fabulous! It looked wonderful on the platter as well. 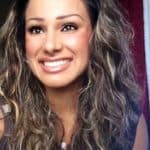 Thank you for sharing your great recipes Karina, the photography is superb as well. These kebabs look like sweet and salty heaven! I love adding fruit to kebabs, it goes perfectly with the savory ingredients! Looks incredible! I love the combination of BBQ and tropical sweetness. Those bacon rashers also sound really good…I’ve never seen them, but I’m definitely keeping an eye out now!